Why did the Swede cross the road? I’m sure we’ve all heard the joke about why the chicken crossed the road, but have you ever heard the one about why a Swede crossed the road? Or rather how a Swede crosses the road? You haven’t? It’s hilarious. Crossing the road in Sweden used to be like a game of Russian roulette. You stepped tentatively out onto the zebra crossing and hoped the motorists would stop, knowing they had no obligation to do so. However, a while ago, a new law was introduced in Sweden. 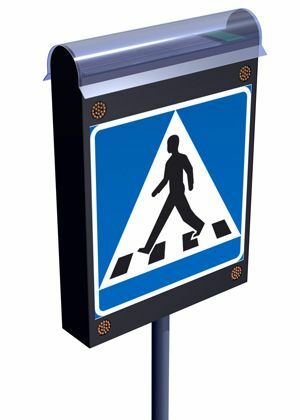 It stated that all cars must stop at zebra crossings to allow the pedestrians to go over. However, it seems like this new law has caused another problem – an increase in road accidents between cars and pedestrians. Apparently, many Swedish people simply fling themselves out onto the crossings because they have right of way and cars have to stop. With the law on their side, they disregard the common sense rules that we all learn as kids. So a new campaign had been launched this week, teaching Swedes how to cross the road. With the slogan ‘Make eye contact before you cross’, the authorities are programming people to actually look at the approaching cars before taking the first critical step. It’s hilarious. But it gets better. I became so engrossed in the small text, the yellow box and the tempting sweeties that I stepped out onto a crossing without checking and almost got mowed down by a cycle courier. So rule number 1 when crossing a road: do not read small yellow boxes and fantasise about sweets. The rest, well, it’s just common sense.